Robert Harding Pittman is a photographer and film-maker concerned with the impact of human interaction with the planet. 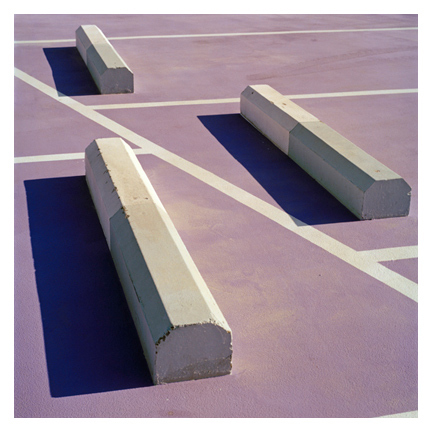 His recent body of work Anonymization is a 10-year project which deals with ‘urban sprawl’ on an international scale. 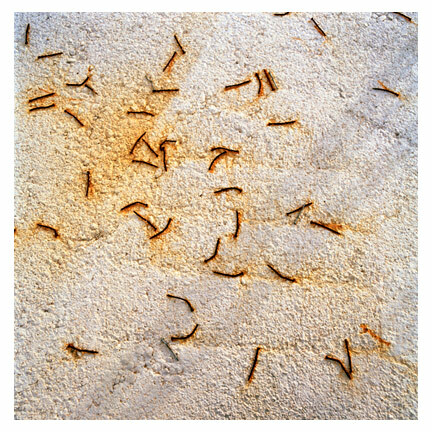 The work finds its outlet as an exhibition and publication (beautifully produced and published by Kehrer) which was nominated for the Prix Pictet Award and has been shown around the world. From American and German descent Pittman has lived, worked and studied environmentalism and photography for most of his life. His passions combine in this project to make a compelling and important reflection on the state of our planet. ANONYMIZATION, the exhibition will open in Spot Photo gallery, LA on Saturday 2nd May and run until 3rd July 2015. Sharon Boothroyd: Could you outline the original premise of Anonymization for us? How did it begin and evolve? Were you always shooting with a book in mind? Robert Harding Pittman: I moved to Los Angeles to study film and photography at the California Institute of the Arts (CalArts). I had never lived in the desert before and very quickly became very passionate about this landscape. 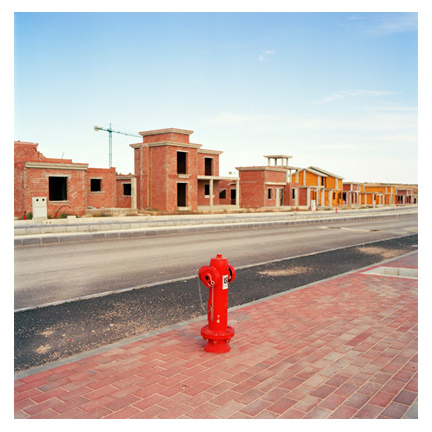 I was in California during the height of the construction boom and began to photograph how the desert was very rapidly being replaced by massive master-planned communities. I lived in a “cookie-cutter” house close to the golf course, in a master-planned community, the very kind I am criticizing in “ANONYMIZATION”. I was both fascinated and horrified by the rapid destruction of the desert and by life in these developments. Never before had I been in an environment, which is so inorganic and so far removed from nature. We lived in a desert, yet every night the sprinklers ran for hours to water the lawns and golf course, to give the appearance of living in the Midwest but without the snow, cold or rain. I had never depended so much on an automobile. Even though I lived in a suburb and not in a rural area, to buy and process film, or to be in an area where I could (finally) see pedestrians, I drove 100km roundtrip, which in Europe would be absurd. 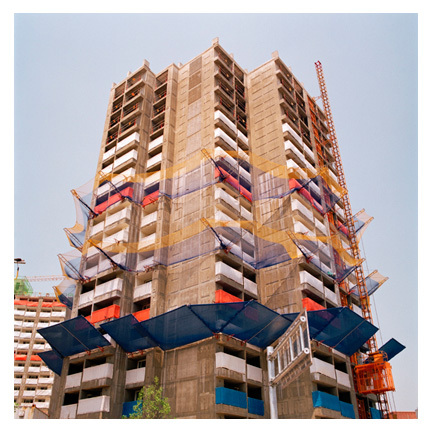 Next I moved to Spain to make a film about and photograph the massive development that was happening there at the height of their construction boom. About two hectares of land were being urbanized every hour in Spain at that time. To my disappointment, the architecture of the new developments was very similar to those I had seen in L.A. These places did not feel like Spain at all. Urban sprawl is coming to Spain, and there is not even a word for it in Spanish. It was then that I realized that this model of urban sprawl is spreading all over the world. People in the USA are very aware of the issues and there are attempts to change things, but in places where it is new, people are less aware of the problems. It was then that I decided to make a global book project about the proliferation of urban sprawl across the globe, for which I also travelled to France, Greece, Dubai and South Korea. Having originally studied environmental engineering why and when did you turn to photography? What does it bring to your work? I have been running around with a camera since I was 8 years old. Photography has always been my passion, much more than engineering ever was. I have also always felt a strong connection to nature and to my surroundings. I originally began studying engineering to one day build aircraft, but I felt it was more important to use my time, energy and knowledge to work towards protecting nature, which is why I ended up specializing in environmental engineering. I soon realized that working only with numbers and data behind a computer would not satisfy me. I felt that cold numbers alone are not powerful enough to move people, governments and companies to change their ways. Numbers lack emotion for most people. I feel and hope that a combination of numbers and emotions can be more powerful in instigating change. I stopped work as an engineer and decided to dedicate myself to photography and documentary filmmaking not only because of the creative pleasure and satisfaction that they offer me, but also I felt I could use these tools to help raise awareness about environmental issues, using emotion combined with facts. With my work I want to give those who are unheard, victims of environmental degradation and the lands they inhabit, a voice. Did you travel to the places (US, Europe and Middle East) in the project specifically for the purposes of the project or did they fit into your travels? It is a combination. The project began in Los Angeles and Spain, as I already stated, as I was studying and working in these places. Dubai, I did expressly travel to for the book. I went to South Korea and Greece to show my films about urban sprawl at festivals. In both places friends told me about the development pressures in their countries and ended up taking me to various locations to film and photograph, which ended up in the book. What are the main similarities, and any differences, you saw in the countries you travelled to regarding development? The sad thing, and that is what I am protesting about with the book, is that these places are all very much alike. In Murcia, Spain they want to become the California or Florida of Europe. In California they want to be the Mediterranean. In China I saw a project called “California County”. In Valencia, Spain they partially built Marina D’Or, where one day they planned to build a Caribbean lagoon with a Jamaican themed resort around it, very close to the Mediterranean shore. In any case the architecture tends to be very similar in all of these places. Most of the developments also have golf courses, be they in the desert of Dubai or in South Korea. There is a certain image of luxury, the good life, at the edge of the golf course, which is becoming more and more uniform. The main difference I saw was in South Korea, where most people dream of living in a high-rise apartment. It is considered to be a symbol of status and modernity to live in a large master-planned complex consisting of multiple high-rise apartment buildings with leisure facilities, often including golf courses, unlike in the West, where the idea of luxury is a complex of low, single-family houses. The expansiveness of this project gives massive scope to the ideas you are working in. Your images include a diverse range of imagery from architectural shots, landscapes and close-ups with strong elements of design. Is your approach to making images instinctive or did you have certain criteria in mind when shooting? How did you begin to make sense of all this during the editing process? Usually my approach to photography is impulsive and instinctive. The more I can connect with what is around me, without thinking too much, the better it is for the photographs. The photographs for the book were taken over a period of about 13 years, so there is a great range of images. I am also a filmmaker and to make editing easier one often films the same subject at three distances – a wide, medium and close-up shot. This kind of thinking at times also comes into my photography. For the book, just as in a film or in a piece of music, I wanted to create a rhythm which has variation and is not monotone, for which having a variety of types of images is important. Most, if not all of the images are empty scenes. Is this important to you? What does it bring to the work? Yes there are indeed no human figures in the photographs, except in two images where construction workers are working at a far distance from my lens. Yet, we humans are very present in the photographs. In the images we see how we control and dominate the earth, by reshaping it, by flattening it and by covering it with roads, parking lots, lawns in the desert and with large-scale developments. All of the structures in the photographs consist of perfect, straight lines. Straight lines do not exist in nature. As I already mentioned, I used to be an engineer and as the world and nature are so complex, we tend to simplify things, one manifestation of which is the straight line. “ANONYMIZATION” takes a critical look at this sense of control over nature, which we desire as a society. 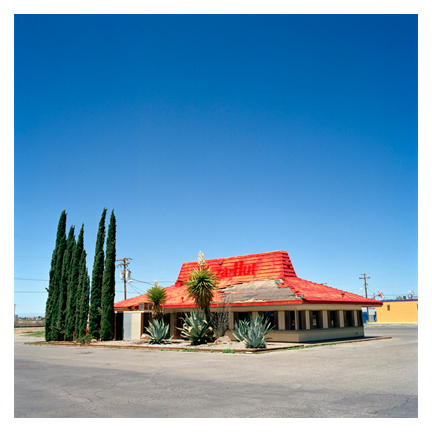 The book, published by Kehrer was nominated for the Prix Pictet Photography Prize. What did this mean for you? The nomination of “ANONYMIZATION” for the Prix Pictet is a great honor for me. The theme was “Consumption” and “ANONYMIZATION” certainly is about the consumption of large amounts of natural resources (oil, water, air, land, etc. ), labor and capital. It is inspiring and encouraging to see that we are many photographers and artists and citizens who do care about the environment and about the future of our children and our earth. The Prix Pictet is helpful in giving some prominence to this movement in photography, which is often under-represented, as issues are often brought to light that are less pleasant. The book is divided into four parts. How did these four structures (sacred ground, conversion, prefabricated, aftermath) of this project first become apparent to you? It took me a long time to come up with these four phases or chapters to structure the book, which is also the structure of the traveling exhibition. I had tried different ways of ordering the images but none quite worked. In some ways I think I used my engineering mind to think of this very simple structure. Regardless of where I went, I always found the building projects to be in one of these four phases. The cycle repeats itself everywhere. If you want to build a big development, the first thing you have to do is bulldoze away all of the vegetation that is there. Then the ground is flattened and terraced. Finally, this ground is covered again with asphalt, lawns, and (ironically) young decorative trees. I was influenced by some very inspiring Navajos I met in Arizona to whom the earth is “sacred”, and this is where that word came from. For them, wealth is having clean air, water and soil, and not having large quantities of goods. These lands are converted into the developments using labor, energy, and building materials, i.e. construction. Construction has been completed and the homogeneous, anonymous developments are finished and people can move in. As we have seen during the first decade of the millennium, overbuilding has resulted in crises. Eventually everything decays to the ground again. Thus we have a cycle where we begin and end with the ground. Tercia Real master-planned community (abandoned). How would you define documentary photography? Would you consider your work to fit within this genre? I think my work fits into both the documentary and fine art genres. It seems that in our society we are always obliged to categorize everything, which at times can be helpful, but at times also oversimplifies reality. What I very much like about documentary photography and film is that the definition can be quite broad. My work is quite “straight” in the sense of “straight photography”. When I find an object on the ground I do not move it. I try to photograph things as I see them. But documentary cannot be free of manipulation and is never objective, nor should it pretend to be. The world is always interpreted and edited by the person behind the lens. What is your main concern as an environmentalist? There is a general disrespect for the earth and a lack of humility toward the planet. In the end this leads not only to environmental problems but also to conflicts between us who inhabit the earth. I believe that if there were more respect for the earth, there would be more harmony amongst us humans and vice versa. When we contaminate some far away corner of the earth, it has consequences not only there, but in the end it affects everyone in some way and in the end it comes back to us. We in the West have most of our goods manufactured in China and it is far away, but some days in Los Angeles, 25% of the air pollution travels across the Pacific Ocean from China. The oceans are polluted with mercury, which comes mainly from the burning of coal in coal fired power plants. Mercury then gets into the fish and finally ends up in the fish we eat. We are a part of the environment and cannot separate ourselves from it. What are you passionate about as a photographer? I love looking. I love light, especially the light from the sun. Whenever I sit on a bus, train, bike, car or plane I take great pleasure in looking out the window and seeing the landscape pass by. I very much enjoy the process of searching for places and objects to photograph. When I have a camera in hand it intensifies my action of looking, helping me to focus and organize what I see in front of me. It helps me be more present and even if I were to not have film in my camera (or a memory card), the act of looking and focusing on something through my viewfinder helps me remember and connect more intimately with the places I visit. The best photographs come when everything comes together in one instant – the light, the place, me with my camera and some kind of magic. If you could imagine a world that had a different way of doing urbanisation – if we used local materials and were sensitive to the culture and climate – what would it be like? This world would look like many old cities do, where people had no choice but to use local materials and had to adapt to the climate. These places grew out of the local culture and also helped shape the local culture. Such a place as you ask me about I feel is much more human, at a human scale, where people can interact and feel integrated and at home. People can walk and move easily in this world without having to depend on an automobile for their everyday lives. In an older city, the workplace, shops, schools and residences are all intermingled making distances shorter. In master-planned communities these spatial functions are separated. For example, a food store is not built next to houses, thus one needs to get in the car to drive to another area where the stores are located, leading to the dependency on the automobile and all of the environmental, health and social problems that this brings with it. Finally I would like to thank you very much Sharon for giving me this opportunity to share my work with your audience. Many thanks to any one reading this for “listening” to me.